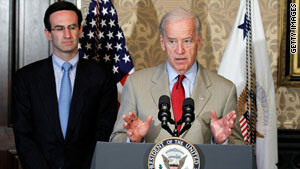 Vice President Biden discusses government waste and efficiencies Friday as budget czar Peter Orszag looks on. Washington (CNN) -- Vice President Biden announced Friday that as part of the Obama administration's commitment to cracking down on waste, fraud and abuse across all levels of the federal government, several initiatives are being put into place to identify and rectify problems, including a "do not pay" list and an online fraud detection tool. Biden was flanked by Office of Management and Budget Director Peter Orszag, who demonstrated a tool allowing the government to keep real-time track of the administration's stimulus plan's expenditures. The tool is also being tested for use in the Medicare and Medicaid programs. The vice president pointed out problems with keeping tabs on contractors associated with the American Recovery and Reinvestment Act, or stimulus act. "One agency bars a contractor; another goes out and hires him," said Biden. The tools allow the government "to build in a much richer set of relationships that can be correlated with potential fraudulent activity," Orszag said. Biden discussed President Obama's issuance of a memorandum Friday creating a "do not pay" list, and said the list is going out to all federal agencies. Meanwhile, the agencies are instructed to review current prepayment procedures and ensure they are reviewing all available database material before releasing any funds. Biden detailed a lot of existing government-wide waste in stimulus payouts, Medicare and Medicaid reimbursements, and elsewhere, but vowed to fight and eliminate it. "Over the past three years, federal auditors have told us that the government paid out benefits totaling more than $180 million to approximately 20,000 Americans who were dead," Biden said. "They say there is life after death," Biden quipped. "I guess so. They're getting a check." He said the federal government paid more than $230 in benefits to approximately 14,000 fugitive felons, or felons who were in jail and are not eligible to receive benefits. He also admitted that Medicare and Medicaid services had a combined $65 billion in improper payments in fiscal year 2009, including about $47 billion in Medicare alone. "No businessman or businesswoman would put up with waste in their company if they found out what we found out," Biden said. "It erodes bottom line not only of balance sheet but also public confidence." Biden said some of the mistakes are human error, but said the new initiatives will make government programs run more efficiently," and "deny criminals opportunity to take advantage."